1. We have scheduled, coached runs and workouts four days a week. Most clubs meet two, maybe three days a week. 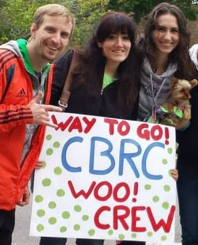 As a CBRC member, you can miss a day and still have plenty of days to run with the group. 2. If you're new to the Twin Cities, join the club! Many of our runners are from out of state and were new to Minneapolis when they became members. If you join us, you will be welcomed into a close-knit group of runners/friends. 3. Our club provides non-exercise-related event programming (Read: happy hours, progressive parties, pub crawls, and more). This is unique among running clubs. There is even one event that combines running and socializing: the Memorial Day Pub Run, which is just what it sounds like! 4. Our location is second-to-none. The Calhoun Beach Club is located on the Minneapolis Chain of Lakes and running trails. While most of our runs are around the lakes, we do head down the Greenway and the different parkways, along the Mississippi River, through downtown Minneapolis and sometimes even St. Paul. The CBC is also conveniently located near Uptown's finest bars and restaurants, which we take advantage of since running makes us hungry and thirsty. 5. We have a dry, indoor, temperature-controlled place to stretch and talk before and after runs (some clubs meet in parking lots). 6. Locker rooms and showers are available for our runners. In addition to being a nice amenity, this is often important when you're driving straight from work or if you have plans after the run. 7. If you're running a marathon but it's not TCM or Grandma's, you will still have a training plan for your marathon. Our coaches have the expertise and flexibility to create a plan for you that allows you to train according to your needs. 8. If you're training for a marathon and your goal is to complete it, not to win it, we can help! Every day, our coaches provide various options for workouts, each with a different distance and intensity. No matter your goal, there will be a workout option that's just right for you!